The Mezzanine Floor Pallet Safety Gate manufactured by Appcon Engineering is designed for the safe loading and unloading of palletized goods from a mezzanine floor or elevated work area. 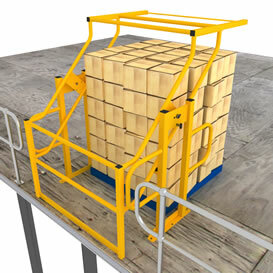 The Pallet Safety Gate reduces the OH&S risks previously associated with this type of operation. 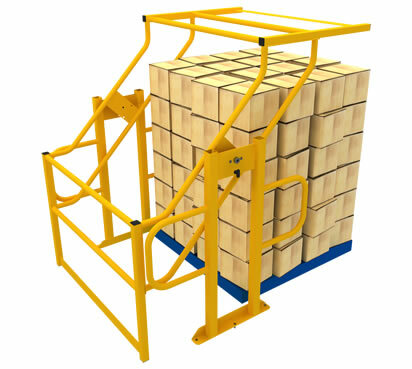 The Pallet Safety Gate only requires around 2kg force to operate. The Pallet Safety Gate accepts a standard 1800mm high pallet and loads up to 1400mm x 1385mm at 1385mm high. Custom load sizes and colours are available on request. The Pallet Safety Gate fits in neatly with most types of hand railing systems and can usually be retrofitted with minimal alterations required. Click here to view a video of the Gate Operating Sequence. Download our Pallet Gate brochure. Note: The purchaser of this product bears the responsibility to ensure that the above product complies with all local regularity and statutory authority’s requirements in the situation in which it is used.